You NEED to get a bill of sale. Whether you’re the seller or buyer, don’t exchange money or property without one. This is only some of the information that can be included on a bill of sale. If the transaction includes any conditions, they should also be included. How many days the buyer has to complete an inspection, deposit details, where and how the title will be sent and any assurances made by the seller are all examples of additional information a bill of sale may include. It’s very important that the document include as many details about the transaction as possible. You can download a generic bill of sale like the one available here or with the button below, or have an attorney draft one that will be specific to your transaction. Most states will have bill of sales available for download from the forms section of their Department of Motor Vehicles website. Reading How to Buy a Car Online, you may have noted that there are a few methods for a buyer to protect themselves in a long-distance transaction. The bill of sale is one of the few legal means that will allow local police to get involved if a long distance transaction turns out to be fraudulent. You can use the document as proof of the agreements you and the seller made to each other. 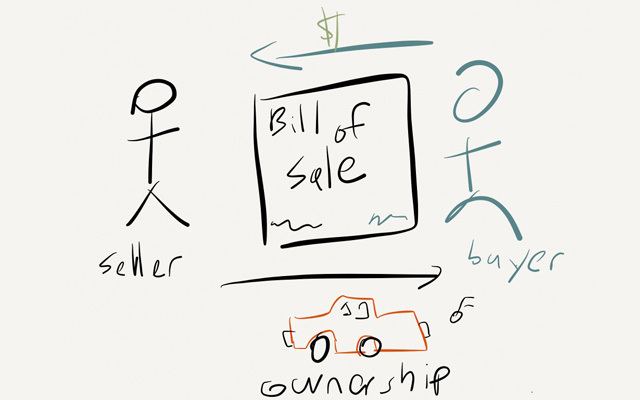 Often the seller will provide a bill of sale, especially if they’re a licensed dealer. It won’t hurt to show up prepared though and have a generic one ready in case the seller doesn’t have one. With a transaction that’s taking place entirely online, you can substitute a series of e-mails for a bill of sale. The e-mail will need to contain the same information as a printed bill of sale. Both seller and buyer will need to agree to the terms outlined within. It’s very important that all responses to the original e-mail be saved as the entire exchange of e-mails can serve as proof of the transaction. WHO REQUIRES A BILL OF SALE? Some states REQUIRE the use of a Bill of Sale to document a transfer of ownership. Below is a partial list. In most cases, the forms you’ll need to use are available for free from your local Department of Motor Vehicles. Contact your local DMV to be sure about the regulations and requirements in your area. Alabama The bill of sale must be a separate document that is used in transferring the title of the vehicle. Forms may be available on a county-by-county basis and may need to be notarized. Arkansas Click here for the required form. Vehicles Information such as make, year, model, vehicle identification number and an odometer reading. Buyer information such as name and address of buyer and buyer’s signature. Seller information such as name and address of seller and seller’s signature. Maine A signed bill of sale must be presented when registering a vehicle with the Bureau of Motor Vehicles, and is used to calculate the excise tax at your local office. A dealer will provide one, but a private sale will require that one be drafted. Nebraska The document can be downloaded here, with further instructions located here. Rhode Island The seller must give the new owner a bill of sale. The document should include all the basic information about the car, such as year, make, model, VIN number, color; it must also include the purchase price. The seller needs to sign and furnish their address, as the new owner will have to supply that information on the registration application when they register the car. South Dakota An electronic version can be found here. Washington The buyer must present the Certificate of Ownership (Title) and this bill of sale to their local vehicle licensing office within 15 days of acquiring the vehicle, or be charged a late fee between $50 and $125. Wyoming The necessity for a bill of sale varies by county. A bill of sale, in combination with an inspection report from a verified professional inspector, provides the best protection a buyer can hope for in purchasing a car online. The peace-of-mind this one document creates is well worth the extra steps. 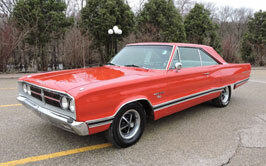 CLICK HERE to read more of How to Buy a Classic Car Online!